Bayo Akinjiyan, who voluntarily resigned from the church in 2013, stated that upon his exit from the church, he had to vacate a N15m house he personally built on Plot 15, Diligence Road, Redemption Camp, Lagos-Ibadan Expressway, which is in line with the policy of the church that a non-member has no right to own any building at the camp. He also wonders why an organisation he was once a part of for 23 years would treat him with “human indignity” and refuse to pay him his due. “First, I want to address the attitude and response of the authorities and leadership of the Redeemed Christian Church of God over the house on Plot 15, Diligence Road, Redemption Camp Estate, Redemption Camp, Lagos-Ibadan Expressway that I handed over to them upon my voluntary exit from the church after 23 years of meritorious service and having risen to the position of assistant provincial pastor. “Secondly, the attitude and response of the Board of Governors of Christ the Redeemers College, Sagamu, Ogun State Nigeria — a private secondary school operated by Christ the Redeemer’s Ministries, an affiliate of RCCG, over an unpaid consultancy fees on projects designed, supervised and or managed by me since 2012. “I know the implications of my actions and having fully weighed my options, I hereby accept full responsibilities for my actions. My decision to inform the Christian community and the larger society is not aimed at destroying or tarnishing the image of anyone or maligning the church that once gave me fire, but rather, it is aimed at putting records straight, and satisfying my God and my conscience. I have prayed over this matter, consulted those that I needed to, and I’ve come to the conclusion that God is on the side of those who have a right standing with Him. “Let us address the first issue — the house at Redemption Camp. In line with the policy of the RCCG mission on those who build on its land, the keys to the house on the above mentioned location, which is a five-bedroom house (all en-suite), valued by a firm of chartered estate surveyors at N15.5m as of December 5, 2011, were submitted to the church through my letter to the General Overseer, dated March 4, 2014 upon my voluntary exit. “Reminders were also sent through four other letters dated September 2, 2015, January 2, 2016, March 10, 2016, and June 27, 2016. Of all these letters and reminders, the only response I had was a letter dated October 9, 2015, acknowledging the letter of September 2, stating as follows, ‘…We wish to inform you that the issues raised in your letter have been referred to concerned officials for their comments and response. We shall get back to you as we receive feedback and further directives from the mission authority. “Almost a year down the line, I am still waiting. My request was that the church should at least officially acknowledge the receipt of the house, even if there is no form of compensation. The God who built that for me can always give me a better one. This is my belief. The need to acknowledge the takeover of the house becomes necessary for at least two reasons: first, when I get to heaven (and by the grace of God I will make it), there will be an official and authentic record from RCCG in my favour, of the house that was forfeited to her as a result of doing the will of the Master here on earth. “I was appointed by the governing board of the above-named college for the purpose of overseeing the projects on a week-by-week basis at a meeting held by the Board on November 28, 2009. My duties and responsibilities were diligently carried out to the letter. When I wrote to the college for payment thereafter, no response was given. I wrote a reminder after two years, the college refused to collect the letter for reasons best known to the official at their reception desk. I thereafter sent it to the General Overseer on March 10, 2016. A reminder was sent in June 2016 and also a personal copy to Pastor (Mrs.) Folu Adeboye, the wife of the G.O., who is a major stakeholder of the college. “For all these to have happened in a church I diligently served for 23 years is questionable in my opinion. I have yet to find out why I should be so treated in this manner even after I had followed due process to secure my release. Please also note that it took the church over two years to organise a send-off in my honour and this was after I wrote the G.O. about it. It took the church over two years and after two separate letters of reminder, to pay royalty on over 30 of my published books in the church bookshops. This also happened after I wrote to the G.O. about it. “Would it be right then to say that perhaps all these are personal vendetta coming from those on whose toes I stepped on while I served through my insistence that right things must be done and I am now being made to pay for my uncompromising stance on corruptive tendencies within the spheres I served and particularly at the college? “I believe that for our nation to be great again, all hands must be on deck. Religious leaders have a crucial role to play beyond praying for the nation. They need to also teach their members and warn against the evil of corruption, expose its tendencies within the system. Then and only then can our nation be sanitised and become great again. The government alone cannot fight and win this humongous battle against corruption. 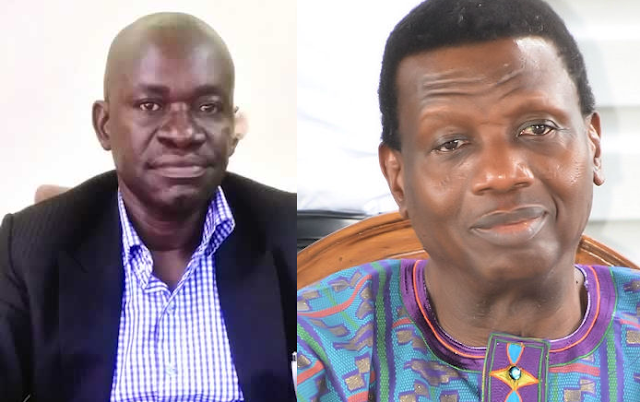 “One thing is for sure: for the leadership of the RCCG to keep ignoring me and all the letters I’ve sent across to it for its own best known reasons would be cutting off its nose to spite its face. I know so much more than anyone could think of and I counsel that they should just let sleeping dogs lie. If this situation persists in the next couple of days, one may be compelled to press for full redress on these issues. I am using this opportunity to call on all those who believe in the course of justice within the church and outside of it to please assist me in this cause. I’m calling on human rights groups and civil society organisations and others to please strengthen my arm through the law if need be. “I also call on the irrepressible media, both print and electronic in Nigeria and in the international community, to conduct investigative journalism and prove me wrong in any of my assertions. A young lawyer friend has provided me legal services so far and has written the appropriate bodies on these issues. I pray the church authority will act fast on this, but if they think otherwise, I am fully prepared for the days ahead. I also know that this journey may be long, lonely and dreary. The wheel of justice may grind slowly, but with God on my side, there is a glorious light at end of the tunnel. “To the Christian community and friends, I demand your prayers at this time. I know some ‘brethren’ will vilify me, abuse and harass me, take me through scriptures on how to resolve church conflicts (I’ve explored all these) or how not to touch ‘mine anointed.’ I know some would call me names, raise non-existing scandalous issues that have not surfaced since I left over three years ago. I know I could be under threat of attack or be monitored. I am not bothered. “What is not worth dying for is not worth living for. Some might ask: You want to destroy a house you helped in building or once lived in? My answer is ‘no’. It is to prevent the house from collapsing on its present occupants that is my concern. Some might ask why fight over mundane issues such as house or money and just N2.1m? My answer is ‘no’. I have been involved in projects for the church to the extent that that if I were to collect consultancy fees, it would have run into over tens of millions of naira, but yet I executed some of these projects with my colleagues in the building industry for next to nothing. “I am not a gold digger nor do I seek to reap where I did not sow. I belong to the Joshua generation and this error of treating with indignity people who follow due process in resigning from the church must stop. I have suffered in the hands of vipers, vultures, lions, crocodiles, pharaohs and goliaths in the church system over the years, I’ve suffered with Christ through obedience to His will. I’ve gone through and still going through ‘indignity’ of living in a rented accommodation, after building a decent house and living in it just because of doing God’s will. I’ve had my own portion of the vicissitudes of life. “I have a different spirit and have followed the Lord fully. Having been given positions of trust and responsibilities and never abused any, I rejoice and see all these as part of the faith package of my redemption through Christ Jesus and in all of these. I’m more than a conqueror. I have no regret of any decisions taken in the past, I have no better yesterday yet, I’m a believer in a glorious tomorrow. I have coveted no man’s silver or gold; I’ve never stolen church funds or church members.